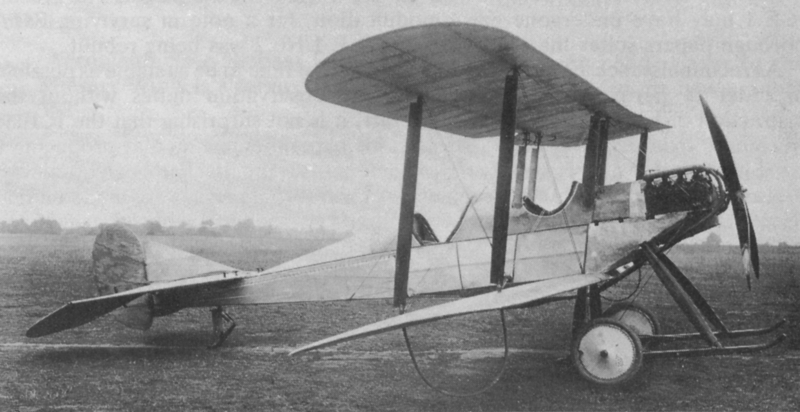 The Royal Aircraft Factory R.E.1 was an experimental two-seat single-engine biplane built before World War I to serve as a reconnaissance aircraft. The Royal Aircraft Factory R.E.1, headed by Geoffrey de Havilland, Henry Folland and Edward Busk, was originally planned as a development of the Royal Aircraft Factory B.E.2. During the planning, however, the aircraft evolved into an experimental aircraft with which sufficient armor should be tested without loss of power. In order to carry this intended armor with the same engine, the weight of the aircraft had to be reduced. This could be made possible by staggered wings, as this reduced the interference between the wings. Thus, the wings were not only offset but could also be built smaller. The saved weight was now used for the use of 1 mm thick armor, which was to surround both the engine and the cockpit. This armor was indeed built, finally used in the two prototypes. In May 1913, the first prototype was completed, in September, followed by the second aircraft. Both were used by Edward Busk for testing purposes to test stability during the flight. Thus, the pilot should be allowed to fly the aircraft on a straight line with as few hand movements as necessary. Meanwhile, the pilot should investigate his surroundings, take pictures and detect any enemy troop movements to later pass them on to the leadership of the ground forces. Several modifications were made during the tests, especially on the wings. These findings were later used in the development of the Royal Aircraft Factory B.E.2c, one of the most important reconnaissance aircraft at the beginning of the First World War. In May 1914, one of the two Royal Aircraft Factory R.E.1 aircraft was handed over to the Royal Flying Corps and assigned to the 6th Squadron. This was dissolved at the beginning of the war and the aircraft handed over to the 2nd Squadron. On August 23, 1914, the squadron was shipped to France and deployed at the front. When used on September 1, it came to the aircraft to an engine failure and it crashed. Meanwhile, the second Royal Aircraft Factory R.E.1 remained in the UK and was used for testing purposes in Farnborough until February 1915.